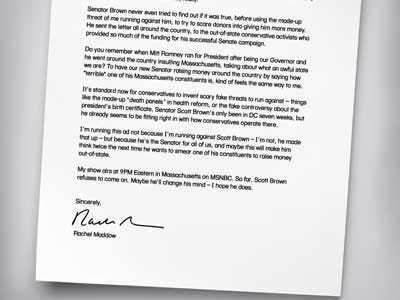 Rachel Maddow's Full-Page Ad In Boston Globe: I'm Not Running Against Scott Brown! Paid for by the committee to spike Rachel Maddow ratings. Forget the brouhaha.Rachel Maddow is not running for the Massachusetts Senate seat against Scott Brown in 2012. In a full-page ad in the Boston Globe today (paid for by MSNBC), Maddow accuses Senator Brown of spreading false rumours and failing to fact-check the rumours as a scare tactic to get donors to put more cash in his coffers. Money quote: It’s standard now for conservatives to invent scary fake threats to run against — things like the made-up “death panels” in health reform, or the fake controversy about the president’s birth certificate. Senator Scott Browns only been in DC seven weeks, but he already seems to be fitting right in with how conservatives operate there. Of course she also squeezed in a plug for her show (“airs at 9PM Eastern”) and mentions Brown is so far a no-show.